Photo courtesy of Kalliste Tours. An uncommon place to spend Christmas is Corsica. The Mediterranean island is a novelty destination for most non-European visitors, who travel there usually in the summer. Why not join the few privileged French and Italian travelers who fly across the blue waters to spend their Holiday vacation in sunny Corsica? “Natale,” Corsican Christmas, is old-fashioned, untainted by excessive consumerism. Christmas time has retained its magic and Corsicans celebrate Christian Nativity as well as ancient formalities from their shamanic cultural past such as rituals honoring the passage of time, and have kept local culinary traditions throughout time. On Christmas Eve, while tenor voices intone Christmas polyphonies, special laser effects project the Nativity on the façade of the 16th century Cathedral where Napoleon was baptized in 1771. During this coming December, there is a special Napoleonic exhibition in the Imperial City of Ajacciu, his birth place, that also harbors the most important museum in France after the Louvre for Italian Painting, hosting more than a thousand works of art. Corsica has the well-earned reputation of being a difficult place to enter. While popular Corsica is relatively easy to explore for independent travelers during the summer time, in the winter, tourists desert the island and the forbidding aspect of the place is intensified. Seasonal businesses are closed, tourism information is unavailable and travelers may be intimidated on this non-English speaking island where most doors are shut, without knowing where to go. 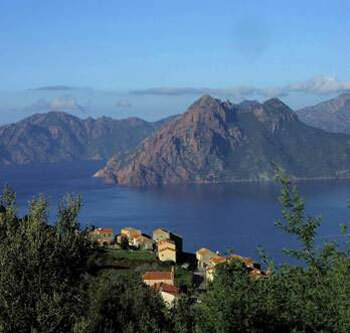 Joining an escorted tour is usually recommended to visit the real Corsica in any season. In the winter, it is a must. Being accompanied by a native who can open the doors for you, lead to visiting lesser-known gems, introduce you personally to artisans and book the best accommodation and restaurants reserved to the local islanders will color your stay with genuine hospitality, spontaneous welcomes and warm contacts with the local people. You will certainly save time and money, and best, you will save your vacation. Kalliste Tours, based in California, specializes in Corsica and its founder and owner, France-Marie Louvet, has handcrafted with native knowledge a special Christmas tour that offers a unique experience with authentic cultural immersion, historical discoveries and gastronomic delights. The escorted tour includes 7days/6nights in a family owned and operated four star Villa Hotel, luxury room with terrace and gorgeous sea view, transfer in private car, refined breakfast, gastronomic lunch and dinner every day, two Champagne receptions, five course Christmas Eve dinner including the famous “Bûche de Nöel” and Christmas Day lunch in a Michelin rated restaurant, private visits, entrance fees, sightseeing, private wine tasting, land transportation, luggage service, tips, ultra-customized service, guidance, personalized accompaniment and translation, assistance to your travel agent to book the most comfortable itinerary as well as to make extra reservations before the tour begins. Groups are 10 persons maximum. Price $5980 per person based on double occupancy. For more information, please visit www.KallisteTours.com. For reservations, please call (831) 438-0907 P.S.T. The Corsican winter gastronomy experience encompasses sea and mountains, and the culture and the history of the island. Produce are local and mostly organic, meats are free mountain range and the art of cooking belongs to shepherds, fishermen and Corsican “Mamas.” However, a new generation of Corsican chefs, both men and women, offer a blend of tradition and refined novelties that ravishes the senses. Corsican trails in the beautiful and scented countryside offer botanical walks and the opportunity to pick myrtle bays to bring back home for new cooking recipes. Fresh picked myrtle bays can be added to stews or desserts, or infused in wine. Corsican wines earned 39 medals, 15 gold, at the Wine Fair in Paris. The famous and unique “Sciacarellu” grape variety is now praised among American wine connoisseurs. The local Christmas market abounds in local delicacies as pastries stuffed with local fresh yew cheese, sweet pumpkins or caramelized onions. The fish market offers to taste sea urchins and local oysters in the shell, and a variety of multicolored Mediterranean fish. After a visit to the local market, a stroll on the harbor invites you to relax among bright colored small fishing boats and palm trees, with, in the background, the typical deep blue sea, more blue than ever, as it is usually during the wintertime. The cobbled stone alleys are bordered with Christmas trees and shimmer with Holiday decorations. Elegant fashion French boutiques alternate with Corsican specialty and traditional small shops, all offering wonderful shopping opportunities. Good places to shop for Christmas presents are artisans’ workshops. Corsica is the home of several master cutlers you can watch forging and hand making damask Corsican knives with handles in juniper wood, goat horn, local semi-precious stones, mother of pearl, silver or olivewood burl. Sightseeing is a wonder in winter Corsica. No big tourist’s buses, just you and the island. All around the coast, about one hundred and fifty Genoese towers watch who is coming from the sea. These 15th century sentinels were built during the Genoese occupation of Corsica. A guided visit of the sites and natural reserve classified by Unesco World Heritage Sites is a must. The beauty is breathtaking; the winter light intensifies the fire red and orange on the rocks and the lapis of the sea and the sky, and only large falcons and sea birds soaring between water and mountains interrupt the silence. During the Yule Season in Corsica, the weather is clement and sunny, in the 60’s during the day, occasionally in the 70’s, and cooler mornings and evenings. The official languages are Corsican and French. The island can be reached by ferry or by plane from France or Italy.